Iceploration was the large scale main-season stage show at Moroccan Palace Theater from February 2012 through April 2017. The show featured ice skating, acrobatics, puppets, and a cast of human and animal characters. Over its run, Iceploration was performed 5,390 times, and won several awards. During its run each season, the approximately 30 minute show was performed several times daily. Replaced By: Turn It Up! The first scene opens inside the bedroom of Austin, a preteen who is a bit more interested in the digital world than the real one. He explains to his friend Max, via monitor, that his Grandpa has asked him to go on an expedition, to which he reluctantly has agreed. The African Serengeti is the first stop on the duo’s expedition around the globe, with larger than life puppets including an elephant and her baby, acrobatic meerkats, and skating gazelles being stalked by a cheetah. Austin and Grandpa next dive into the ocean at the Great Barrier Reef. The scene includes aerial acrobats, helium-filled puppets seemingly swimming and floating around, and a number of talented skaters. Austin gets into the fun by swimming with a sea turtle. At the top of the world, Grandpa and Austin visit the Arctic. They sled in being led by a team of Siberian huskies, before Grandpa goes to collect and ice sample. He encourages Austin to explore, and just in case anything happens, entrusts the boy with his compass. Austin experiences a bit of his own magic, including a spotting a Siberian lynx and an encounter with some animated ice blocks. The scene closes out with Austin and Grandpa enjoying the spectacular Northern Lights, and a beautiful performance by the talented couples skaters. The tour around the world ends in the Amazon Rainforest, with Grandpa and Austin dropping in from above before watching a chorus of colorful skaters and a back and forth between playful frogs and a dragonfly. Rambunctious squirrel monkeys show off their acrobatic skills, with Austin getting in on the fun for a few moments as well. The grand finale is set to the show’s signature song, Meet the World. Below is the full show from its second week of public performances, recorded on February 12, 2012. A special event to announce a new show was held inside Moroccan Palace Theater on September 8, 2011 to a crowd of around 500 park guests and invited media. Park president Jim Dean shared details on the ice show that would open at the park on February 2, 2012. 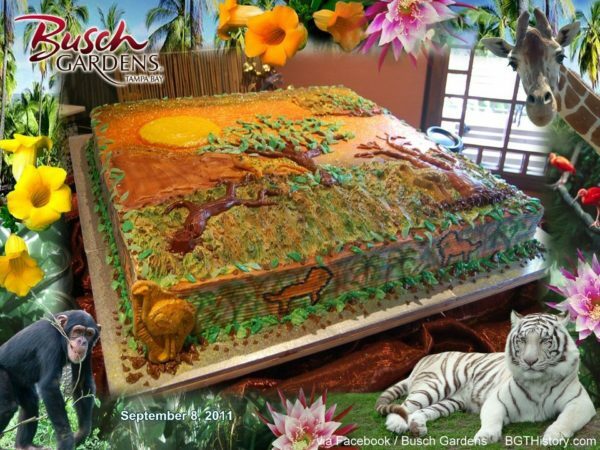 The announcement event also featured two elaborately decorated cakes, each measuring four feet by four feet. Performers modeled a few of the costumes that would be used in the show, and a couple of the animal performers were also on hand to celebrate the announcement. 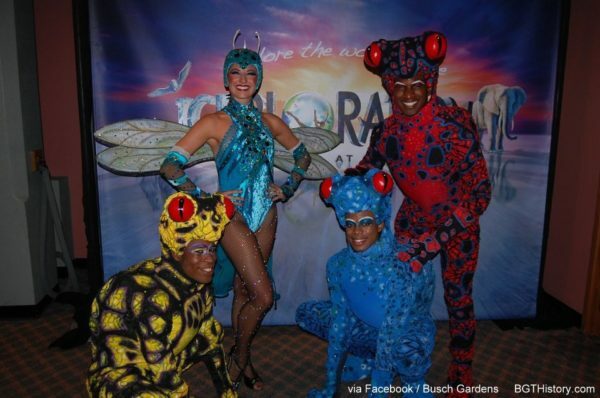 For more than five decades, Busch Gardens Tampa Bay has set the industry’s standard for delivering unforgettable entertainment experiences, with Broadway-style stage spectaculars like KaTonga: Musical Tales From the Jungle and innovative ice shows like World Rhythms on Ice. This winter, the park will combine some of the most amazing aspects of its entertainment history and debut its biggest ice show to date: Iceploration takes the stage on Feb. 2, 2012. Starting February 2, a cast of 20 brings to life an all-new adventure filled with world-class skaters, more than 75 original costumes, amazing aerial performances, master puppetry and live animal stars, with shows daily in the Moroccan Palace. African Serengeti. Here, larger-the-life puppets and spectacular set design bring elephants and other awe-inspiring animals to life at a watering hole. 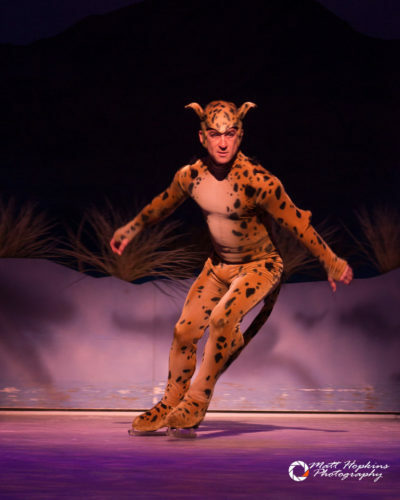 Solo and chorus skating performances accompanied by acrobatics tell an anecdote of an agile cheetah stalking graceful gazelles and meerkats. Great Barrier Reef to explore the harmony of life on the ocean floor. An amazing black light transition and never-before-seen helium-filled puppets immerse the audience in the wonders of the sea, filled with parrotfish and lionfish, sea urchins, turtles and a moray eel. Arctic, majestic skaters become striking snow flurries as a winter storm threatens the travelers. Austin and Grandpa witness even more beauty as they encounter the Aurora Borealis phenomenon, represented with theatrical lighting and projections. 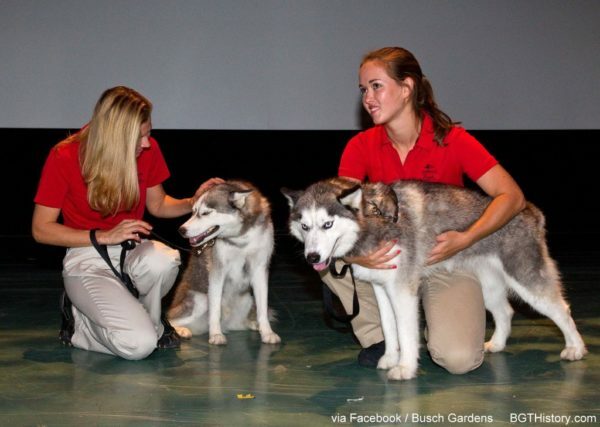 Then, they share the stage with amazing live animal stars, including a Siberian lynx and a sled of Siberian huskies as they continue to traverse the tundra. Iceploration performances are included with any daily park admission or annual Pass. Austin looks like any kid you might find in your neighborhood. He’s a slightly cynical (approximately) 11-year-old boy who is armed with wireless technology that gives him access to just about anything. To Austin, there doesn’t seem to be a reason to step out into the world when you can bring the world into your room with a few clicks on a computer. In fact, Austin can play with an entire playground full of kids his age from the comfort of his favorite chair. He’s not concerned the playground is a virtual world or that his avatar looks nothing like him, or that no one knows his real name. The games he plays are full of adventure and he’s developed quite a few buddies who all help each other out on their various missions. When Austin’s environmental scientist Grandpa offers to take Austin along as an assistant on his next scientific fact-finding trip, Austin isn’t interested. Although Austin loves his technology-challenged Grandpa, he thinks he’s a bit of a “dinosaur.” But Austin’s grandfather isn’t deterred by the boy’s lack of enthusiasm. He plans to introduce his sun-starved grandson to the wonders of a first-hand experience with the natural world. Grandpa (Mr. Jones) is a seasoned explorer who has traveled worldwide to conduct research as an environmental scientist. He is a ruggedly handsome, in his late 50s to mid 60s and is accustomed to being self-sufficient. Equally at home in a University lecture hall or in the wilds of the rainforest, Grandpa’s innate sense of how to peacefully co-exist with all living things informs every moment of his life. Though Grandpa has had to learn how to use modern technology in his research, he finds the constantly changing nature of technology tiresome. It’s not that Mr. Jones is resistant to learning, it’s just that by the time he finally figures something out, it’s already been replaced by a newer version. As a result, he often reverts back to his “old school” way of doing things. To him it’s just simpler. When Jones decides it’s time to engage his 11-year-old grandson in the great outdoors, he knows the only way he’ll get Austin to come is if he puts him in charge of the more technical aspects of the trip. 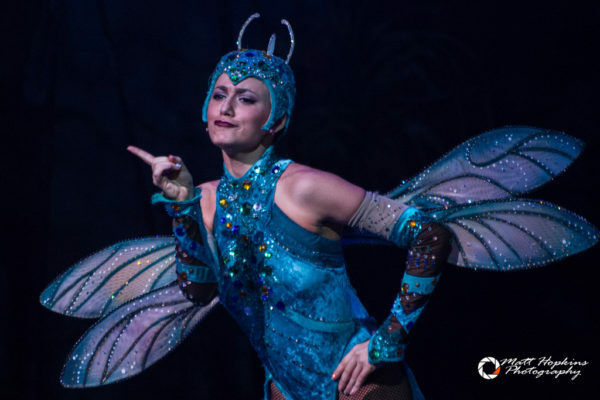 Iceploration’s 77 costumes were designed by Tony Award winner Gregg Barnes, and took more than 10 months and nearly 500 yards of fabric to construct. Barnes worked on the designs for almost an entire year, beginning with rough pencil sketches and discussions about colors. The costumes needed to be able to withstand the movement and athleticism involved in the performance, but also solid enough to not need constant replacing. Barnes said in an interview the most challenging costumes to design were those in the Arctic scene, as unlike the others which drew from animals for inspiration, those drew inspiration from more elemental forces. It took 10,000 gallons of water to create the four tons of ice used on stage for the production. A contest was held in late January on the park’s blog, inviting guests to leave an original four line rhyming poem or verse in the comments for a chance to win an Iceploration prize pack with a large, Iceploration insulated freezer bag, a tin of Iceploration mints, and an Iceploration-logo ice cream scoop. Annual pass members were able to enter through the Nairobi gate at 10 a.m. every Friday and Saturday in February 2012 for an exclusive performance of the new show. A limited edition commemorative pin exclusive to pass members was available for purchase at select gift shops for $5.95, with a portion of the proceeds going to the SeaWorld & Busch Gardens Conservation Fund. 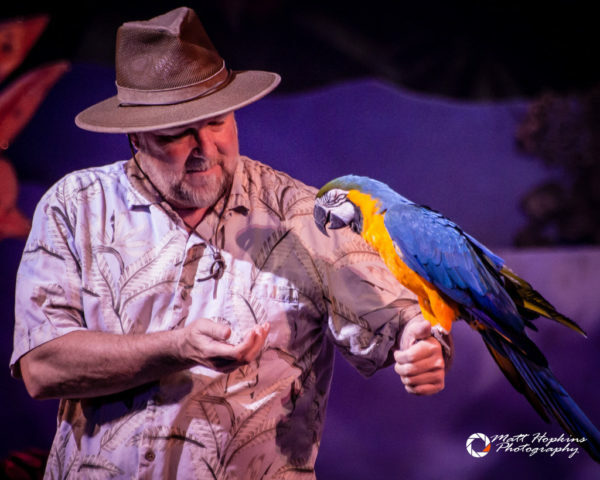 At the time of the show’s opening, the performance featured a total of 21 animal stars included Keesa, a Siberian lynx, King, a Eurasian eagle owl, Anastasia, and African crowned crane, and Siberian huskies Maji, Shivers, Journey, and Delilah. In earlier seasons, a girl sometimes played the role of Austin. In later seasons, the show was re-worked slightly with the character’s name changed to Kaitlyn when a female was in the main role. Other small changes over the years were made, but the overall storyline remained the same throughout the show’s run. Opening day of the 2013 season was January 16. 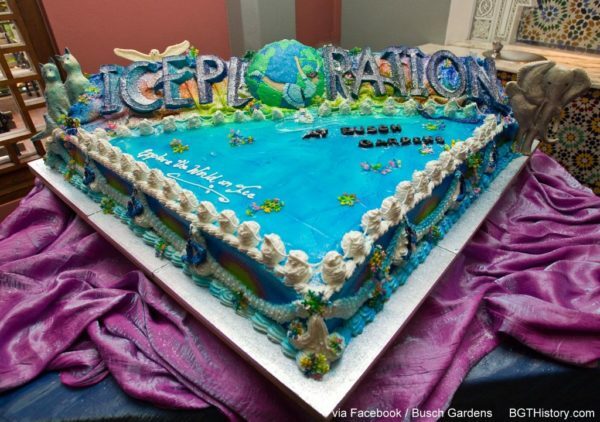 Later that year, on October 3, Iceploration hit its 2000th performance. By September 17, 2014, the show reached its 3000th performance. When it closed for the season on November 9, 2014, the tally stood at 3,158 shows, equaling 104,214 minutes. January 14 was the opening day for the 2015 season. That summer, Iceploration was ranked fifth as Best Amusement Park Entertainment in the USA Today’s 10Best Reader’s Choice awards. On September 9, 2015 the show hit 4000 performances, and went on to end the season on November 8 with 4,183 shows performed. 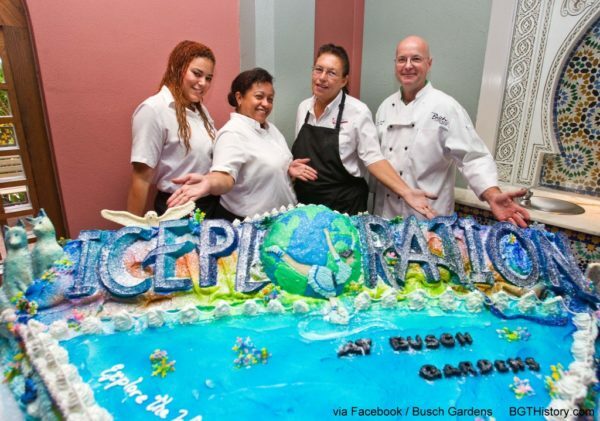 Iceploration returned on February 14, 2016, later than normal due to a renovation of Moroccan Palace Theater. The season ran through November 6, closing out the year with 5,077 performances. In early 2017, rumors that the show would be closing soon began to circulate. The official announcement came on January 26 from the park that the show would be closing in April. The final performances were held on Sunday, April 23. 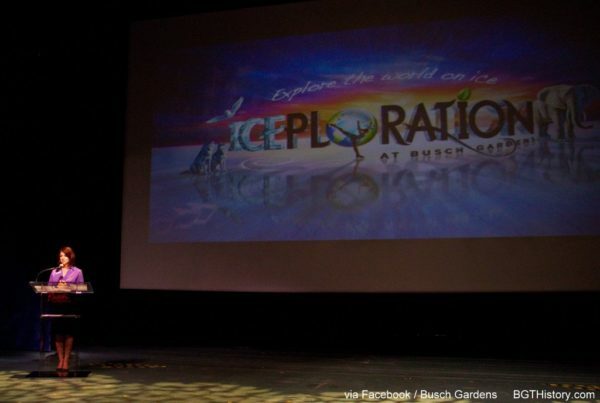 At its closing, it was reported Iceploration tallied 5,390 public performances in total. Additional details and images of the Iceploration will be added in the future.